Ever since Universal opened its Harry Potter theme park, people have been making a beeline for the Butterbeer. Their frothy, spiced specialty has a fanbase almost as big as Harry's, though it famously -- and sadly -- contains no actual alcohol. 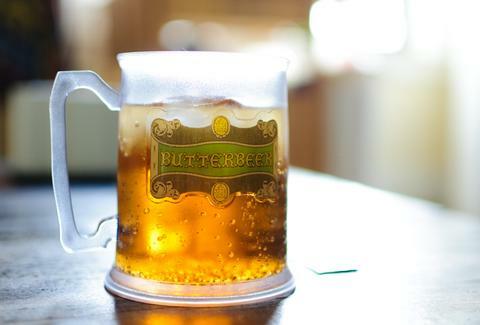 POPSUGAR is out to fix that with their own recipe for Butterbeer, which contains real beer, and also real butter(scotch sauce). The stupidly simple guide teaches you how to brew Butterbeer hot and cold, just like Ron and Hermione's relationship. While the recipe yields just one pint, they helpfully note that you can make large batches for Halloween parties or especially raucous ABC Family marathons of the movies. Use this information well, HP geeks. It's what Dumbledore would've wanted. Kristin Hunt is a Food/Drink staff writer for Thrillist, and really could've used a Butterbeer after reading the ending of the fifth book. Follow her to Harry Potter-induced heartache at @kristin_hunt.